Along the Meclis-I Mebusan Caddesi the Cagdash Museum being (re)built(?). The Wikipedia has "Elgiz Museum of Contemporary Art (Turkish: Elgiz Çağdaş Sanat Müzesi) is a private collection museum, founded by Dr. Can Elgiz. 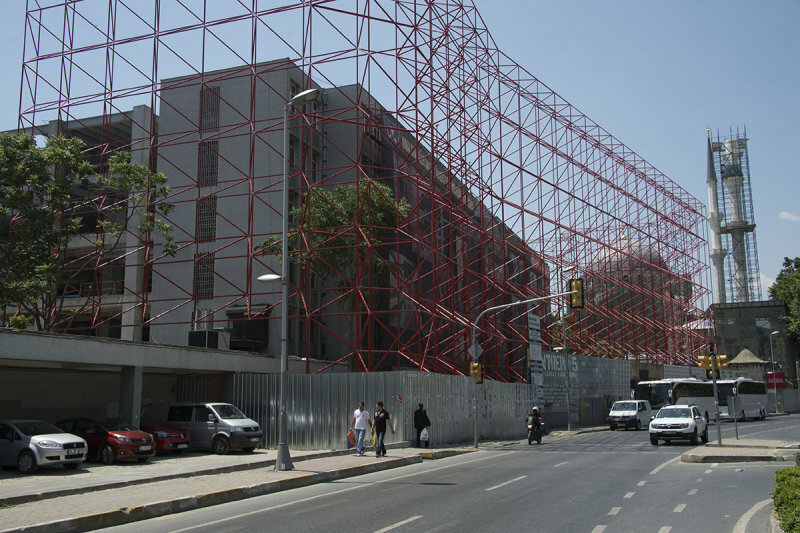 The museum opened in 2001, when there were no non-profit institutions in Turkey dedicated to contemporary art. Established with a mission to promote the development of contemporary art in Turkey, the initiative focused on giving space, support and international visibility to projects by young Turkish artists. As new art institutions and museums bloomed in Turkish art scene in 2005, the collectors converted the space to a private collection museum under the name ‘Elgiz Museum of Contemporary Art’ to host the Elgiz Collection. Elgiz Museum of Contemporary Art is located in the dynamic business district of Istanbul, Maslak and is open to the public free of charge."